I've been reading Andrew McCarthy's travel memoir The Longest Way Home as of late. It's a terrific story of Andrew's solo adventures to places we wouldn't choose for our annual holidays -- Patagonia, for example -- as well as a tale of a man conflicted between his solitary trips and the new family he has waiting for him at home. If you look underneath those storytelling layers, there's yet another theme to his memoir -- coming out of the curve. I'm not talking about Andrew righting himself when he gets lost in Vienna; rather, I'm referencing the curve in the road which led him to life as a travel author. With a successful movie career and membership in the illustrious Brat Pack, things seemed to be going well for Andrew during the 1980s and 1990s. Then he it a curve as the roles dried up and he battled the ravages of alcoholism. He came out clean and sober, but another bend was up ahead. After a spiritual walk across St. James Way, Andrew hugged the figurative hairpin and came out a different man - willing to settle down and commit himself to a new career. Hence, how Andrew McCarthy, actor, became Andrew McCarthy, award-winning travel author. Many of us have hugged the same curve as Andrew - minus the Hollywood stardom, of course. We've been absorbed in other careers and lives when, without a yellow sign of warning, a curve pops up on the metaphysical highway. Though some take the curve slow - sometimes stopping to absorb the view - others hug it so tightly they rocket away in a brand new direction. The same concept applies to what we write. The manuscript sitting on our computer can be almost done, but another idea may pop into our heads quicker than a cup full of Pop Rocks and Coca-Cola, changing the whole concept and thought of the story. In these types of situations the author can let the idea sit on the railing or push it through the curve to see how it turns out. Sometimes the inclusion of werewolf zombies works for your romantic steampunk novel, and sometimes you have to reverse around the curve to get back to where you started. 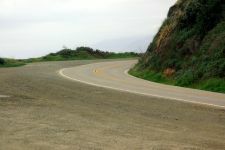 To close on a philosophical note, life is never a straight line - it's full of curves and dips. It's whether you decide to plow ahead or see how others get through first that determines who you are and what your writing will be. What curve brought you into the writing world? Great analogy, Rich. And the cars keep going faster making the curves more dangerous. Thanks. Great post Rich. The curve that brought me into writing had to do with the need to teach my 2nd grade students how to use comma in a list and do it in such a way that they would remember it. And it was because of this, I wrote and self-published, Cornelius Comma Saves the Day. Quite simply, returning to fishing...and learning to fly fish, after moving to CO.
A reconnection with life as I had once lived it and previously written about it as well.